So as we all know, Pinterest is the devil. Fine, fine, it's not...but it's pretty darn close. It was always easy to find recipes online but MAN does Pinterest ever take things to the next level. Now I don't even have to think, I can just scroll. Case in point: A knock-off White Castle Burger recipe. It's now been the better part of four months since I've eaten fast food, and as hard as I try, I still miss it (you have no idea how humbling/cringe-worthy/depressing it is to write that). That being said, I've never actually been to a White Castle but every time I see Harold and Kumar, I wonder just how delicious the tiny burgers are. Okay, so I have to admit that aside from the ingredients, I didn't follow this recipe. There was just something about meat re-absorbing it's grease in an oven that wasn't terribly appealing. Since we're BBQ enthusiasts, we opted for the grill. Seriously. That's all there is. Onto the BBQ, the teeny-tiny burgers went. (Err...we were having people over for supper. They weren't all for us). 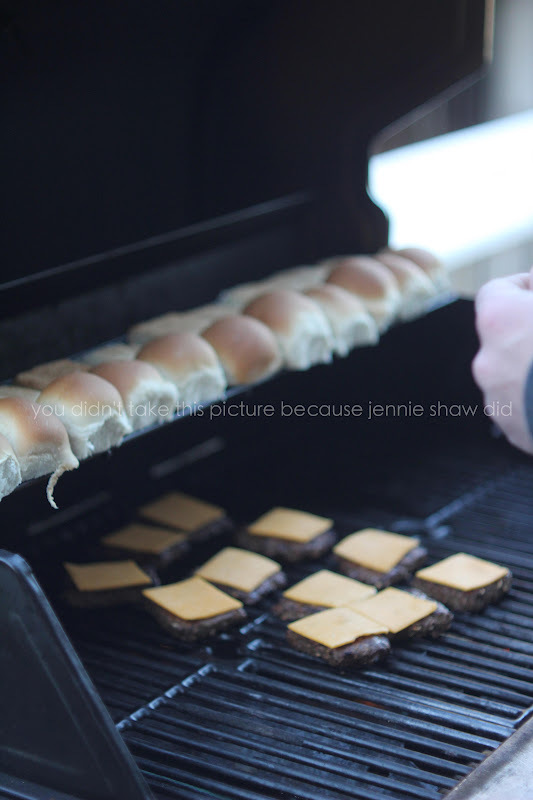 The patties shrunk to a perfect size for the buns. Oh, and we used "real" cheddar cheese instead of the plastic slices. With a pickle, a couple squirts of ketchup and mustard and the little baby burgers were good to go. And let me tell you - they're DELICIOUS! Don't you just love it when a super simple recipe ends up being AMAZING? I know that I do!! And in an unrelated note, make sure to enter my very first giveaway! There are a few things up for grabs including a MYSTERY PRIZE! that is all we would eat on our spring break trips so we could afford "refreshments"